Audio Enhancers, the leader in the automotive speaker cabinet industry, announced today the addition of the GMX125, its newest speaker cabinet. "We're in our 25th year of service," shared Ted Sharp, president of Audio Enhancers, .and we are able to offer more models than ever. We.re excited to introduce the GMX125 and know our customers will be pleased with its sound performance.. The GMX125 enclosure is custom-built for the new body 2007-2008 Chevrolet/GMC extended cab truck. Designed to accommodate the truck.s 60/40 split-seat model, the enclosure has a dual down fire of 1.25 total cu.ft. per sub cu.ft. 0.63. 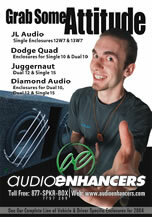 Thanks to the cabinet's extended power pockets, Audio Enhancers. 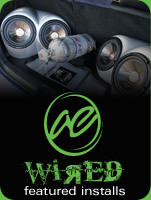 innovative design allows more mounting depth and greater speaker power. The cabinet is available in either a 12-inch version with a mounting depth of 5.5 inches or a 10-inch version with a mounting depth of 5.75 inches. Both are available in charcoal gray carpet. Audio Enhancers is a member of the Mobile Electronics Competition Association (MECA) and the Mobile Enhancement Retailers Association (MERA). 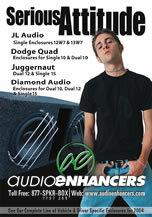 For more information, please contact Audio Enhancers at 866.775.7269 (SPKR.BOX) or visit audioenhancers.com.